Are All Essential Oils Safe For Cats? When I started using essential oils, I didn’t think about my cat and whether they would affect her or not. 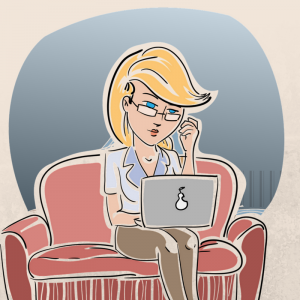 One day she was behaving strangely and seemed extremely agitated. She was not trying to bite or scratch, just seemed very uncomfortable. She started pacing and meowing, following me around. The only way I can describe it is agitated. I couldn’t figure out what could be troubling her. Then I made the connection. Shortly before she started that behavior, I started diffusing 2 essential oils in the same room where she was. That’s when I started researching if essential oils are safe for cats. 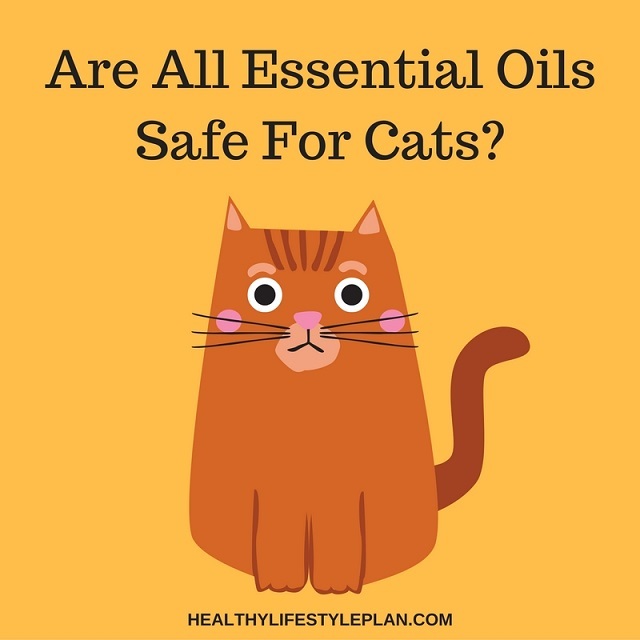 Essential Oils and Cats: Helpful or Harmful? Depending on who you listen to, some essential oils and cats may not mix very well. I found an interesting article over at Vet Street. They pointed out that while some essential oils may be beneficial to humans, those same compounds can be toxic to pets. And keep in mind that a cat’s sense of smell is much more intense than that of a human. No wonder my Miss Blu was so irritated from the essential oils I was diffusing! Digging deeper into the effects of essential oils on cats, I also discovered a few lists of essential oils that should never be used around our feline friends. Unfortunately not all the lists were exactly the same. When it comes to essential oils and cats, always use your judgement when diffusing oils in the same room as your cat and be aware of their behavior and any risks. Even though Lavender was on many of the lists that I found, I did put Miss Blu on her pillow in the bedroom and put a drop of Lavender on the pillow. She did calm down and slept for a few hours. 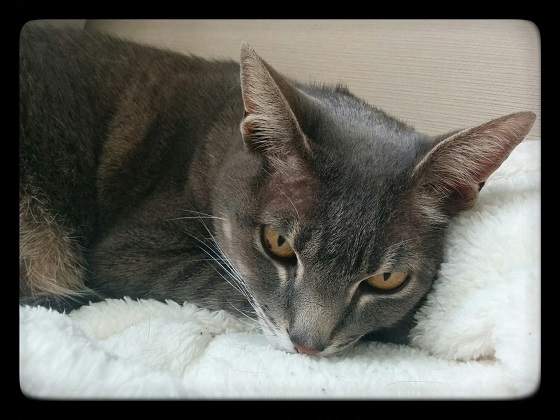 Here are 3 tips that I hope you find helpful when using oils around your cat. If you are diffusing essential oils, chances are that your cat is breathing in the oils that are dispersed into the air. If the oils are toxic to your cat, they can get into their system quite easily. Use the essential oils on your body instead. 2 – Don’t pet your cat with essential oils on your hands. Sometimes we don’t realize that after applying essential oils, our exposed skin can easily transfer those oils to the cat. I always wash my hands after essential oil application before petting Miss Blu the cat. Not only can the oils be transferred to her fur, but she will immediately try to clean her fur by licking and that’s a sure way for the oils to get into her system. Essential oils are wonderful to clean some household surfaces! But be cautious with surfaces that your cat can potentially lick or jump on. 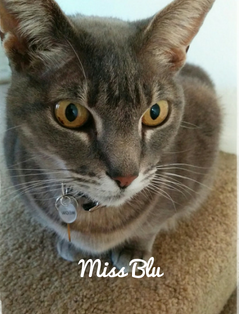 Miss Blu never jumps up on the kitchen counters but my previous cat did! And she would lick everything in sight. I love essential oils and the benefits they provide me. But now I am more cautious when using them around Miss Blu. I don’t want her to be agitated or get ill so I am following the above tips. Since learning this information about essential oils and cats, I still use them because the health advantages for me are too good to pass up. Have you noticed any odd behavior from your feline friends when using essential oils? Please do share in the comments!